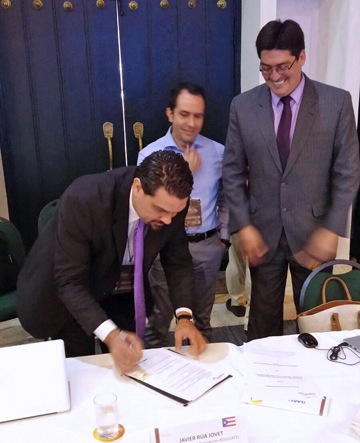 From left: TRB President Javier Rúa-Jovet, Colombia's telecom regulator Juan Manuel Wilches and REGULATEL's president-elect for 2017, Pedro Huichalaf sign the agreements. From left: TRB President Javier Rúa-Jovet, Colombia’s telecom regulator Juan Manuel Wilches and REGULATEL’s president-elect for 2017, Pedro Huichalaf sign the agreements. The Latin American Forum of Telecommunications Regulators (known as REGULATEL for its initials in Spanish) confirmed unopposed a pair of agreements of understanding reached with the Internet Corporation for Assigned Names and Numbers and the Federal Communications Commission under the tenure of its chairman, Javier Rúa-Jovet. Rúa-Jovet is president of the Puerto Rico Telecommunications Regulatory Board. Through the agreement confirmed during the REGULATEL’s 18th annual plenary session held in Colombia, FCC staff will now learn more about regulatory debates in Central and South America. Meanwhile, REGULATEL members will be able to benefit from the FCC’s expertise on today’s most relevant telecom industry issues — net neutrality, spectrum management, and universal service, among others. REGULATEL brings together 23 countries from Latin America and Europe and its mission is to foster cooperation and coordination of efforts among organizations of telecommunications regulators of different countries. Latin America members are: Argentina, Bolivia, Brazil, Chile, Colombia, Costa Rica, Cuba, Ecuador, El Salvador, Guatemala, Honduras, Mexico, Nicaragua, Panama, Paraguay, Peru, Portugal, Puerto Rico, Dominican Republic, Uruguay and Venezuela. The member countries of Europe are Spain, Portugal and Italy. During Rúa-Jovet’s tenure, REGULATEL became active in ICANN’s Governmental Advisory Committee, and is now building an even stronger bilateral relationship, he said. ICANN is the U.S.-based organization operating trans-nationally, responsible for assigning Internet protocol addresses, among other functions. During the plenary, REGULATEL’s pro tempore presidency was transferred from Puerto Rico to Colombia. Chile’s Subtel was elected president for 2017. Hey Buddy!, I found this information for you: "REGULATEL backs MOUs reached by PR with regulators". Here is the website link: https://newsismybusiness.com/regulatel-reached-regulators/. Thank you.